The average car shopper today makes just two dealership visits in the search for the perfect vehicle. 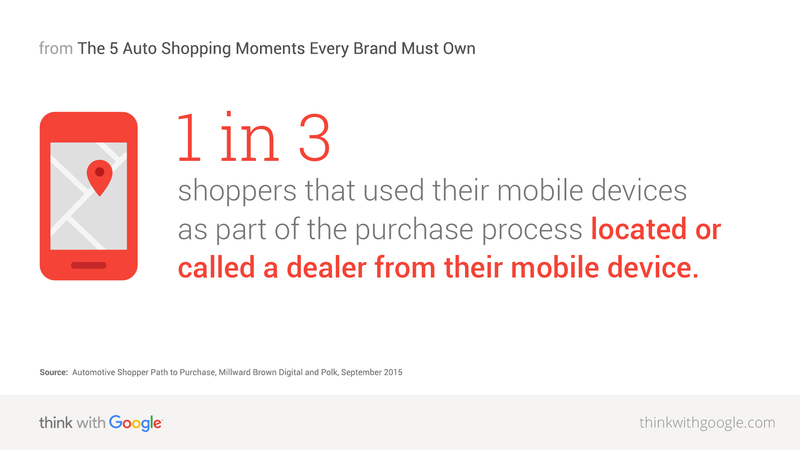 That’s because today car shoppers turn to mobile to research models, find deals, and get real-time advice. David Mogensen, Google’s head of YouTube ads marketing and former automotive marketer, shares how to tap into this new auto buying process. Some of my fondest memories as a child were spent with my Dad, shopping for a new car. Going from dealership to dealership, climbing in and out of the vehicular jungle gyms perfectly arranged on the showroom floors. When I went to work in the auto industry a decade later, I learned that these weren't just my wonder years. They were the golden age for the auto industry, too. They represent a time when people were loyal to brands and got their answers at the source—a local dealership. My, how things have changed. Far from the daylong adventures of my youth, the average car purchaser today makes just two visits to dealerships.1 Sparked by digital, and ignited by mobile, those indelible moments with my dad have been replaced by countless micro-moments—times when car shoppers turn to digital to help select the perfect vehicle for their needs. Six out of 10 car shoppers enter the market unsure which car to buy.2 To help narrow their choices, many start by consulting someone they trust. This can come in the form of reaching out to that one friend we all have who is bizarrely obsessed with cars (a hat I proudly wear), by reading blogs or forums, or by searching for review sites like Edmunds, KBB, and Car and Driver. At some point, a shopper needs a reality check: will this car fit my needs and my life? Information about practical considerations, like seating accommodations and the number of airbags, are the hallmark of this stage. 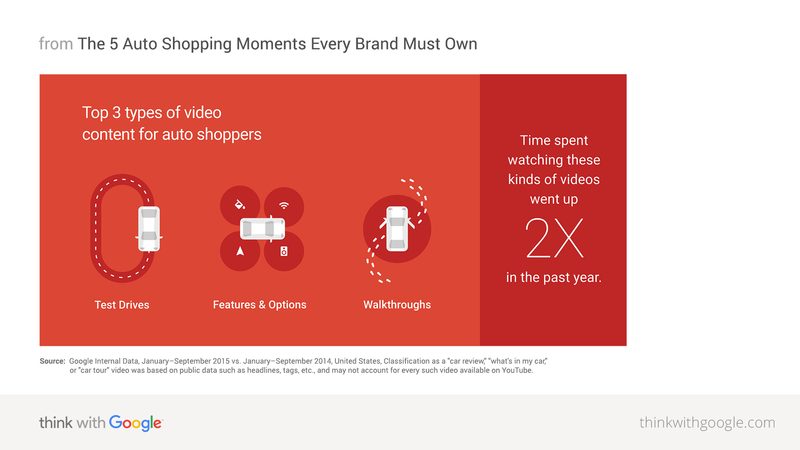 Source: Google Internal Data, January–September 2015 vs. January–September 2014, United States, Classification as a "car review," "what's in my car," or "car tour" video was based on public data such as headlines, tags, etc., and may not account for every such video available on YouTube. Search interest for: "cars for sale under $[x amount]"
Beyond the "where," shoppers also look for the "when" and "what." Search interest for "are dealers open Sunday," for example, is popular, particularly on mobile phones (making up 84% of those searches).21 Search interest for inventory, to find if the right car is in stock, is growing more than four times faster than overall auto search interest.22 And while websites and apps can often answer those questions, sometimes a good old fashioned phone call is still the way to go—with search interest in dealer phone numbers up over 78% in the past year23 (the majority of which, not surprisingly, happen on mobile24). OK. The deal just got real. The shoppers are on the lot. And they know what they want. But they need to know they're getting a fair deal. In other words, this stage is all about that game of poker we all play as consumers, sitting across the laminate desk, looking at pictures of the sales person's kids, asking ourselves "could someone with kids that adorable NOT be giving me the best possible price?" Interested in more auto and industry-related content? Sign up for our newsletter. 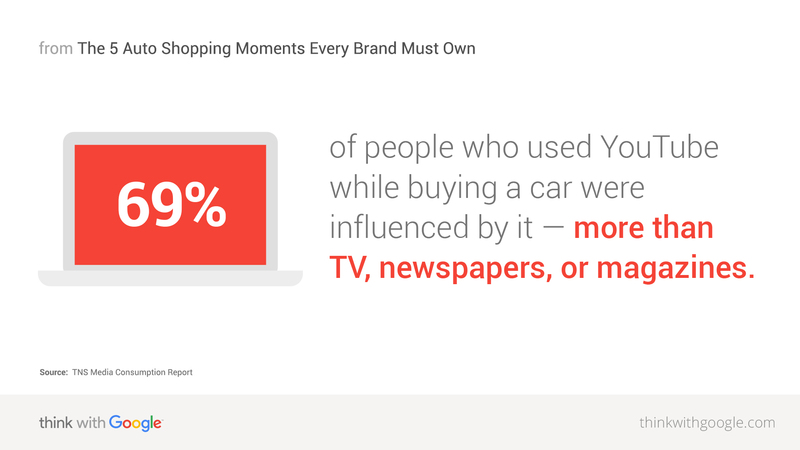 This is a time of increasing opportunity to connect with auto shoppers. They're researching more and adding more and more vehicles to their consideration lists. The first brand searched is the same brand purchased only 22% of the time.29 But, more often than not, your chance to win over a shopper isn't just happening in person, it's happening online—often on a smartphone. Here are three things to keep in mind to make sure it's your brand and dealership they choose when they're ready to buy. BE USEFUL: Beyond being there, consider how you can best meet people's needs at each step. If you work at a dealership, help make it easy for customers to do the things they do most, like value their trade-in, search for prices and inventory, or find your store. If you're a manufacturer, help when people are looking for videos and images of your cars, exploring configurations and building their own, or comparing your brand to competitive vehicles. And don't forget to make it all as easy on mobile as it is on desktop. 28 Aggregated anonymized internal data from a sample of US users that have turned on Location History. Queries were considered as being "from" a location if they occurred within one hour of a user visit to a car dealership. September 2015.